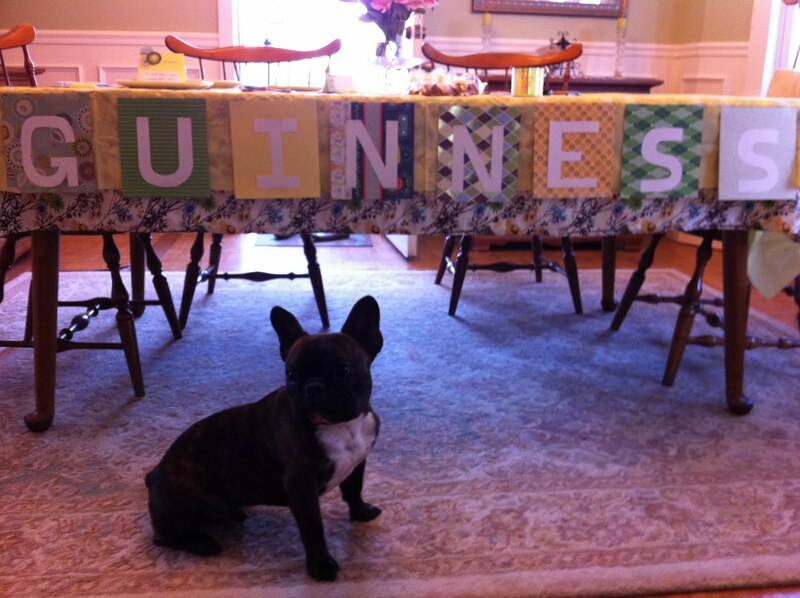 Guinness & Basil: Guinness Birfday Partay! It's my birfday mymymy birfday!! 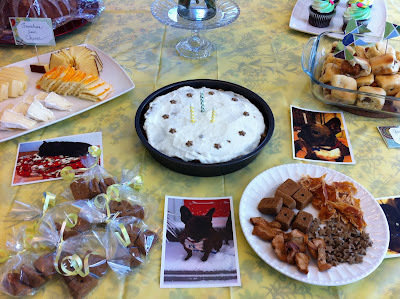 Mom and dad threw me a birfday partay to celebrate my turning of 2 yrs and 3 monfs old. 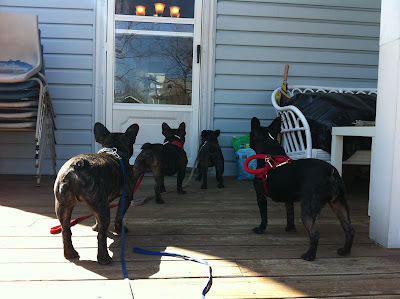 Dey invite ma frenchie fureinds from FBRN and we had lotsa fun! Dats how you spell my name in hooman language. In doggish it's arfsnort! Ellie Mae (left) and Basil (right). Mom says since Basil lives here, we had to invite him. Oh alright! Mu favorite furiend Mr. Gibbs came! He can walk now and was zoomie all over da place. Look at the huge tongue! Mom lubs him arot. 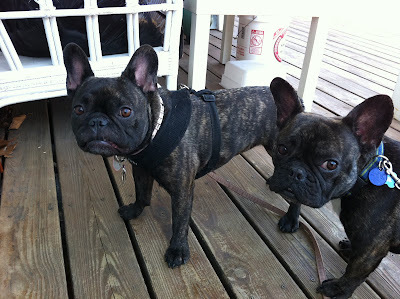 Mu other favorite furiend who is a girl Nadia came over! She's so cute. 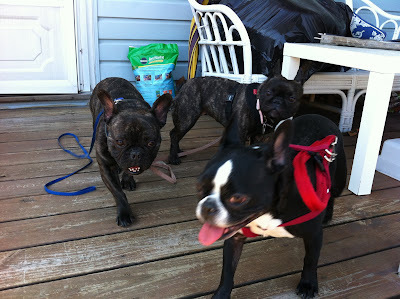 We haf lots of fun running around da yard. See our youtube videos! It looks like Ellie is getting jealous that Basil is paying attention to Nadia. 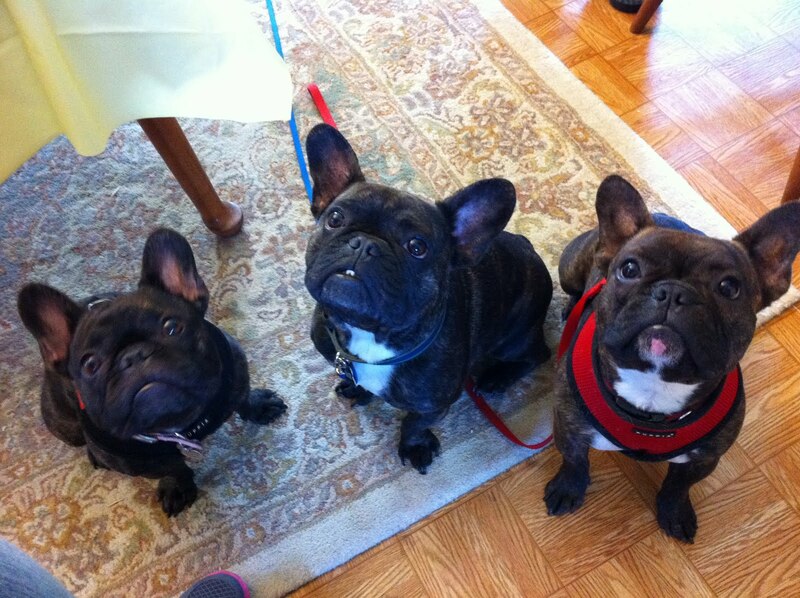 Ellie, Basil and me. 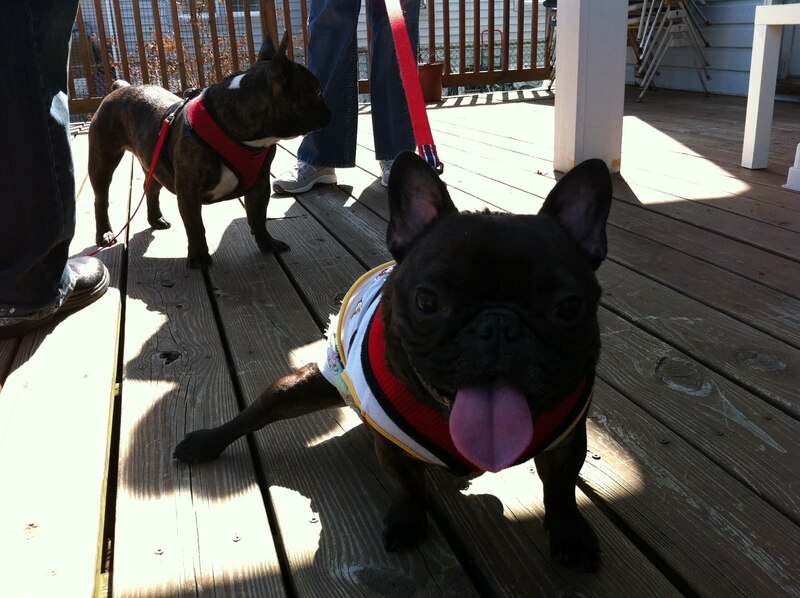 I haf the special red harness on. 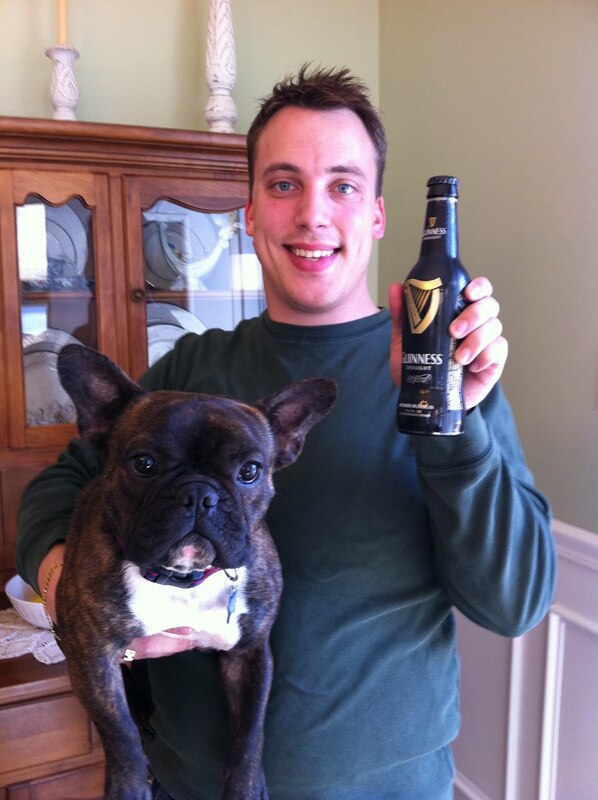 Dad thought he was funny by holding two Guinnesses. Mom must lub me more dan Basil. She made me dis deleeeecious banana cake with Embark from Honest Kitchen. Sum of mu furiends and their pawrents. Den we go out and play sum more. Don't we look like a gang? Mom calls us the Brindle Mafia. 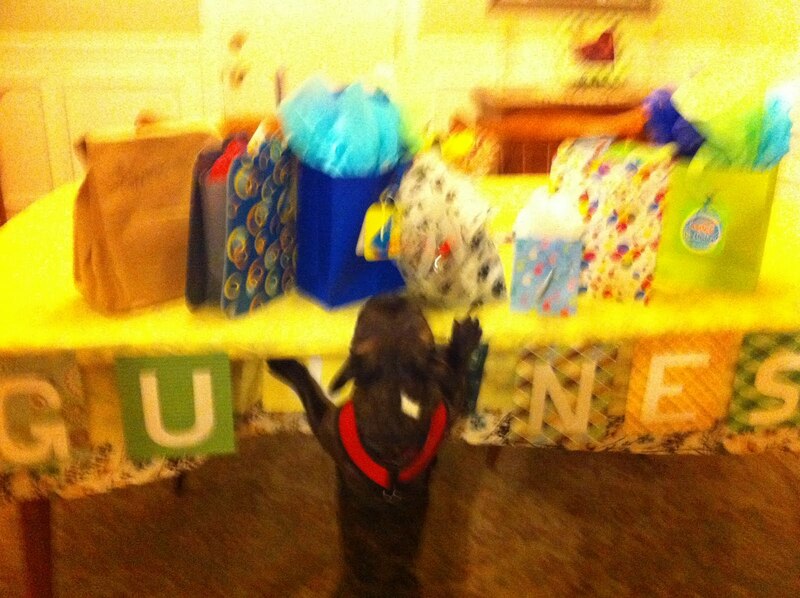 Can I open my gifts yet?! THANK YOU TO ALL MU FURIENDS FOR COMING AND BRINGING ME SUCH YUMMY GIFTS! I HAD SO MUCH FUN!